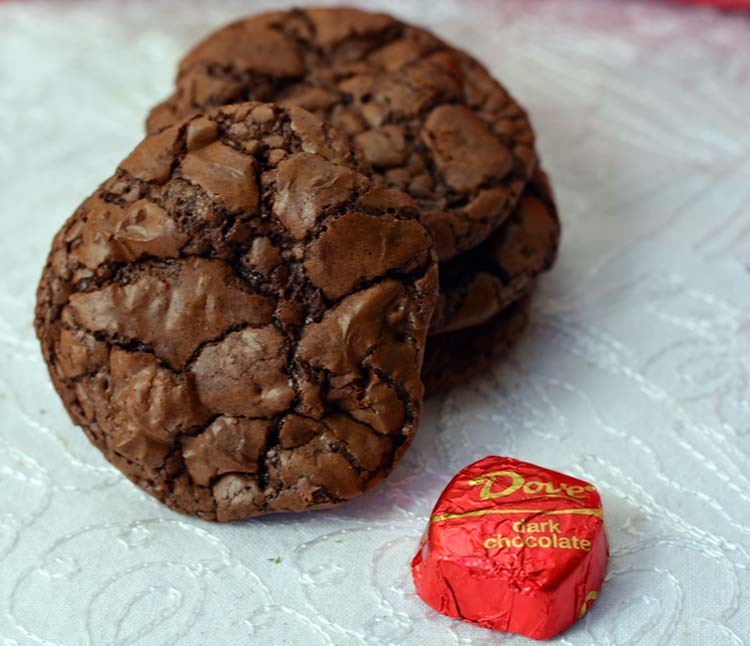 Christmas cookies made with DOVE® PROMISES® Dark Chocolate will soon become a family favorite. 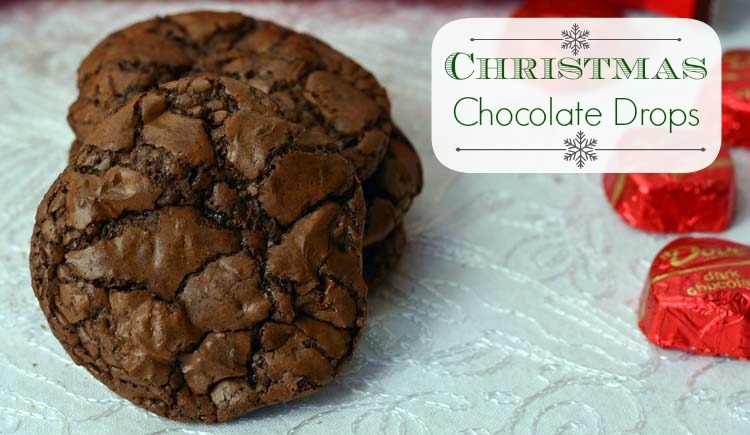 DOVE® PROMISES® Dark Chocolates are melted with butter to create the base of these amazing Christmas cookies. When it comes to baking Christmas cookies, I try to find an easy cookie recipe that has amazing flavor. The holiday season can get so busy that it gets hard to find time to bake. When I saw this Christmas Chocolate Drops cookie recipe on DOVE®'s website, I knew it would be a winner. 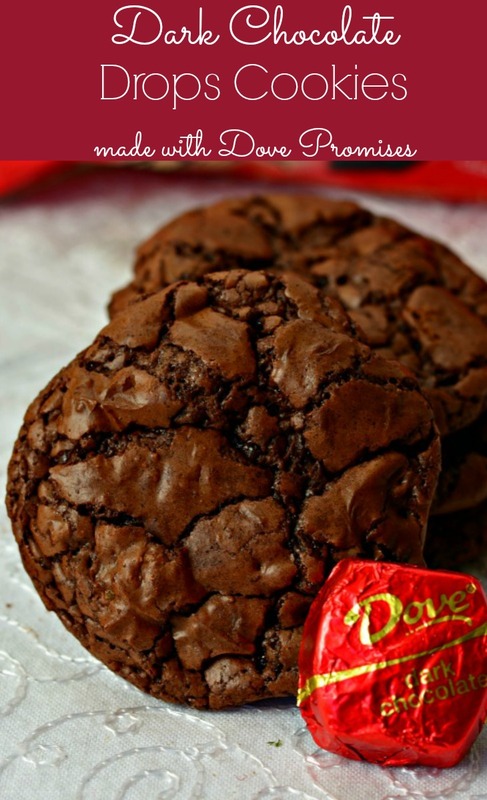 You simply can't go wrong with a cookie that is based on melted DOVE® PROMISES® Dark Chocolates. I've mentioned before that I'm a bit of chocolate snob, and DOVE® PROMISES® Dark Chocolates make my top 10 list of delicious chocolate. Not only do you use melted chocolate in these cookies, but you also chop up more and mix it in to the cookies. Chocolate with a side of chocolate. The Christmas Chocolate Drops are really easy to make, too. I was a little concerned about the batter once it was made. 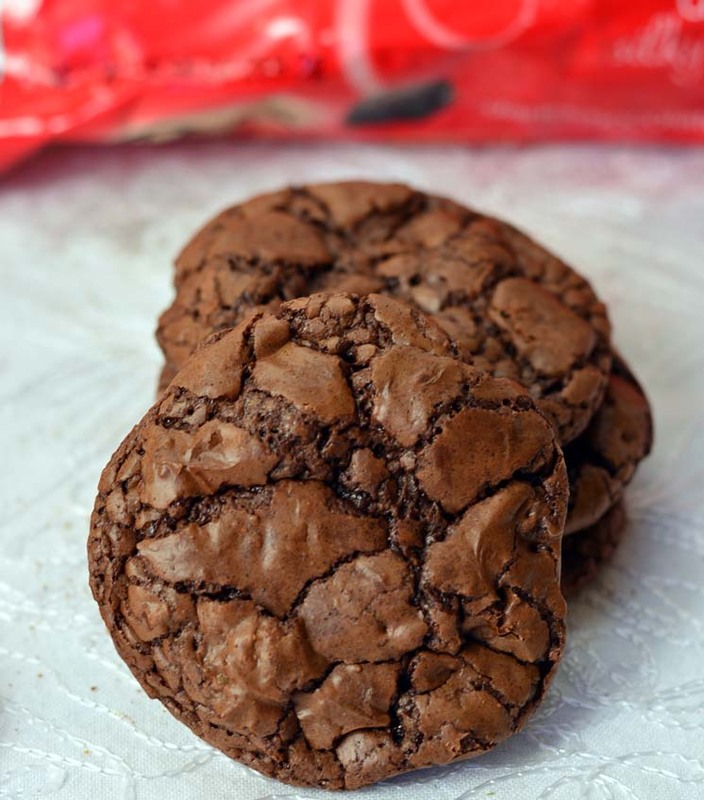 The batter is more like a brownie batter than a stiff cookie dough. But don't worry! Just scoop the dough with a tablespoon or cookie scoop and I promise they will bake up into delicious, soft, chocolatey cookies. Share the Joy with Dove®. 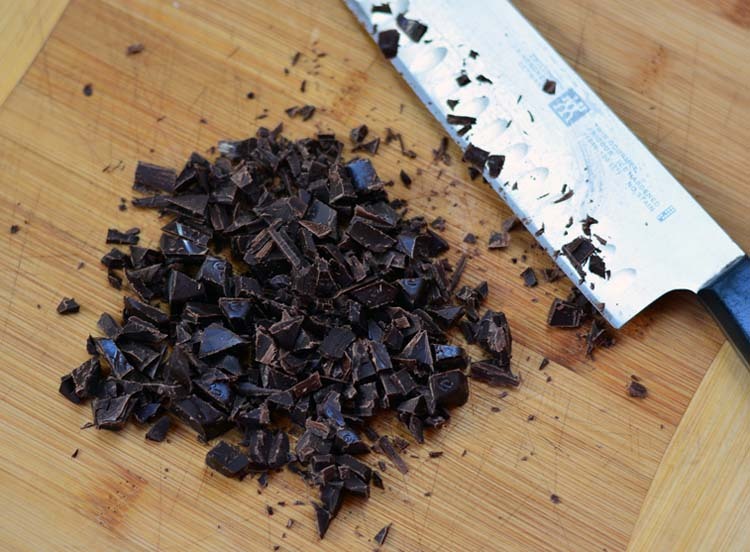 Go to BrightIdeas.com for recipes using DOVE® PROMISES® Dark Chocolate and DOVE® Silky Smooth Dark Chocolate Bar. Click. Create. Celebrate. Preheat the oven to 325 degrees. Line 2 cookie sheet pans with foil and set aside. boiler until smooth. Remove from heat and let cool to room temperature. Meanwhile, roughly chop the remaining chocolate and set aside. In a large bowl, beat the eggs and sugar until thick and light yellow, about 2 minutes. Stir in flour mixture and cooled chocolate and beat for 1 minute. Fold in the remaining chopped DOVE® PROMISES® Dark Chocolate and nuts. Drop tablespoons of batter onto the prepared cookie sheet pans about 2 inches apart. Bake for approximately 10 minutes, or until just firm. Remove from the oven, transfer to a wire rack and cool for 5 minutes before removing from the cookie sheet pans. This is a sponsored conversation written by me on behalf of Mars®. The opinions and text are all mine. 10 minutes was not long enough for these to cook. When cooling they flattened out very thin and were so doughy I could not get them out of the pan. I did not add the nuts as you said they could be done without; however maybe this is the only way to keep them together. Bake time definitely depends on a lot of factors. I always start around 8 minutes and then watch. They would be just fine without the nuts! The real star of the show is the Dove chocolate! Dove chocolate in cookies?? Yes please!! Santa’s going to love these! These cookies look awesome! Thank you so much for taking the time during this busy season to share your wonderful post with Full Plate Thursday. Have a wonderful weekend and hope to see you again real soon! Wow! These look and sound divine! Yum! Camille, I love ultra dark chocolatey cookies. The fact that half the bag of Dove is melted into the batter sounds exceptional. Pinned! Visiting again this week from Inspiration Mon. Thanks for coming back, Jelli. These were amazing! What great pictures and these look delicious! Love the chocolate with a side of chocolate! That’s my kind of cookie! Dove is delicious, so creamy and rich. Oh My! Those look so delicious! I promised my son I would try to do more baking and he looooves chocolate, so I may just try this recipe. Oh no, I have not had my lunch yet and now I am craving these cookies. They look amazing! Mmmmm, I pinned these! I love a double chocolate cookie like that!